During the two press conferences on two channels separated by an hour or so in time and a million miles in tone, Kevin Garnett and Josh Beckett reminded us that they have one thing in common beyond the standard intense fame and seemingly endless zeroes on the paycheck of the modern athlete. A extraordinary gift for defiance. Not that the way one uses it at all resembles how the other does. On Garnett, the victor in the immediate aftermath Thursday night of what astute observers said was his defining performance as a Celtic, his defiance was both serious and amusing, an admonition not to write him off at age 35. On Beckett, stone-faced and outwardly indifferent in defeat, his stubborn defiance was enough to make you wish the World Series star of just five years ago would pack up his spikes, glove, smirk, fading fastball and collection of fancy new punch-top Miller cans and go back to the mansion, hunting blind or some combination thereof where he spends the 4 1/2 offseason months that apparently don’t count as days off in his mind. For Garnett, there is no perception problem. His was defiance as pride, a way to use slights both real and imagined as fuel for his extraordinary and intense performance in the Celtics’ Game 6 victory over the Hawks. For Beckett, it was defiance as petulance, an almost daring refusal to concede that perhaps playing golf wasn’t the brightest idea considering the Red Sox are dead-last in the American League East and seem to careen off rock-bottom every other day. “I spend my off days the way I want to spend them,” he said. It was surprising he didn’t punctuate it with a belch. Garnett was reminding us not to doubt him. Beckett, yet again, was giving us every reason to just that. While Garnett has made adjustments this year — his willingness to play center, a position he has long loathed, is a tribute to the people skills of Doc Rivers and the respect his players have for him — I really do not believe Beckett ever will. I’m not sure he’s capable, and not just because he was central in burying a manager in Terry Francona who had many of the same strengths as Rivers. Beckett, born with lightning in his arm, has always been this guy. I remember interviewing him during his brief stay in Portland a decade ago during his rapid ascent to the major leagues, and the only differences between then and now were that he swore more creatively, had a haircut not even Bryce Harper could love, and was probably 30 pounds lighter. The attitude worked for him when he had a 97 miles per hour moving fastball to fall back on. 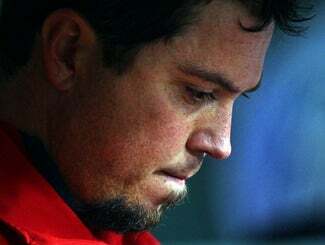 It worked for him in 2003 and ’07 when he was integral in championship runs. When all was right, his attitude was even part of his charm. But now, in the wake of the September disaster that has somehow bled into this season, a disaster in which Beckett was both complicit and, surprise, defiant about, you’d think the man would mature and learn to deal in humility and accountability from time to time. It’s not like he hasn’t had a lot of opportunity to practice recently. But while his fastball his lost a few crucial ticks of velocity, that defiance is as blazing as ever. Because Beckett doesn’t appear to take great care of himself and seems too stubborn to admit his heat will never be what it was in his youth, I’ve always thought he would lose it faster than a pitcher of his ability usually would. I wrote in the offseason that they should consider trading him, though I never expected that they would do so. No matter how much Sox fans howl for it, no matter how loud the boos become, it’s not happening now. He’s a 10-5 guy, meaning he can veto a deal to any destination he does not like. He’s pitching poorly. His reputation is tattered. He has two years left on a four-year, $68 million deal. He’s not going anywhere other than the driving range, and given his history, the disabled list for a two-week siesta this summer. 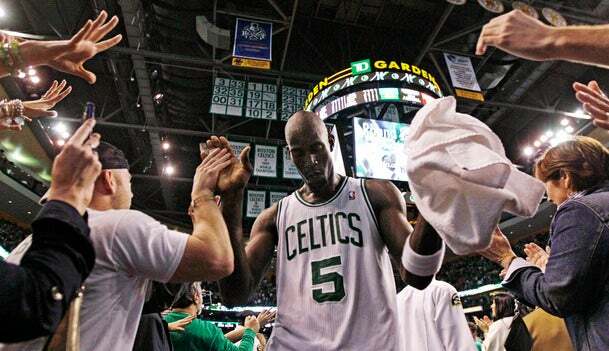 Garnett hinted last night that this might be his last year. Let’s hope that is not so for many reasons. He is not the one among last night’s defiant duo who should be leaving. But wouldn’t it be just like Beckett to stick around for two more years and force the remaining Fenway faithful to watch him stink up the joint. What a final masterstroke of ignorant defiance it would be.